National Consortium on Aging Resources for Seniors' Equity What Do We Do? 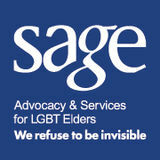 Funded by the Administration on Community Living (ACL), the National Consortium on Aging Resources for Seniors' Equity works to decrease the prevalence of disparities among racial, ethnic minority and LGBT older adults, their families and caregivers, by providing technical assistance to the Aging Network. Did You Know? 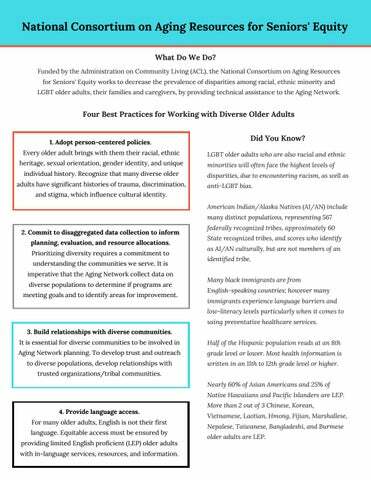 LGBT older adults who are also racial and ethnic minorities will often face the highest levels of disparities, due to encountering racism, as well as anti-LGBT bias. and stigma, which influence cultural identity. American Indian/Alaska Natives (AI/AN) include many distinct populations, representing 567 2. Commit to disaggregated data collection to inform planning, evaluation, and resource allocations. Prioritizing diversity requires a commitment to understanding the communities we serve. It is imperative that the Aging Network collect data on diverse populations to determine if programs are meeting goals and to identify areas for improvement. federally recognized tribes, approximately 60 State recognized tribes, and scores who identify as AI/AN culturally, but are not members of an identified tribe. Many black immigrants are from English-speaking countries; however many immigrants experience language barriers and low-literacy levels particularly when it comes to using preventative healthcare services. written in an 11th to 12th grade level or higher. trusted organizations/tribal communities. Nearly 60% of Asian Americans and 25% of Native Hawaiians and Pacific Islanders are LEP. 4. Provide language access. For many older adults, English is not their first language. Equitable access must be ensured by providing limited English proficient (LEP) older adults with in-language services, resources, and information. More than 2 out of 3 Chinese, Korean, Vietnamese, Laotian, Hmong, Fijian, Marshallese, Nepalese, Taiwanese, Bangladeshi, and Burmese older adults are LEP. This project was supported in part by grants from the U.S. Administration for Community Living, Department of Health and Human Services, Washington, D.C. 20201. Grantees undertaking projects under government sponsorship are encouraged to express freely their findings and conclusions. Points of view or opinions do not, therefore, necessarily represent official Administration for Community Living policy.